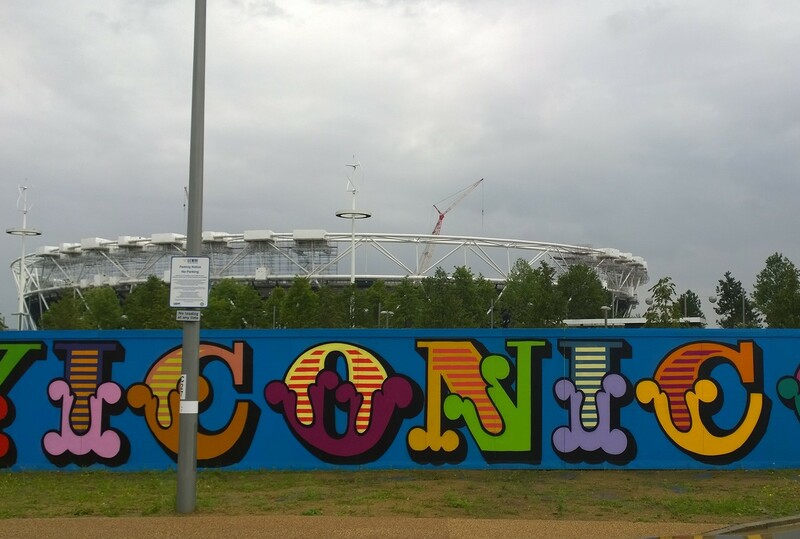 Ben Eine, the man who made his name painting stylised lettering all around the East End of London has created his biggest mural yet, a 385 metre painting on hoardings close to the aquatic centre in the Olympic Park. 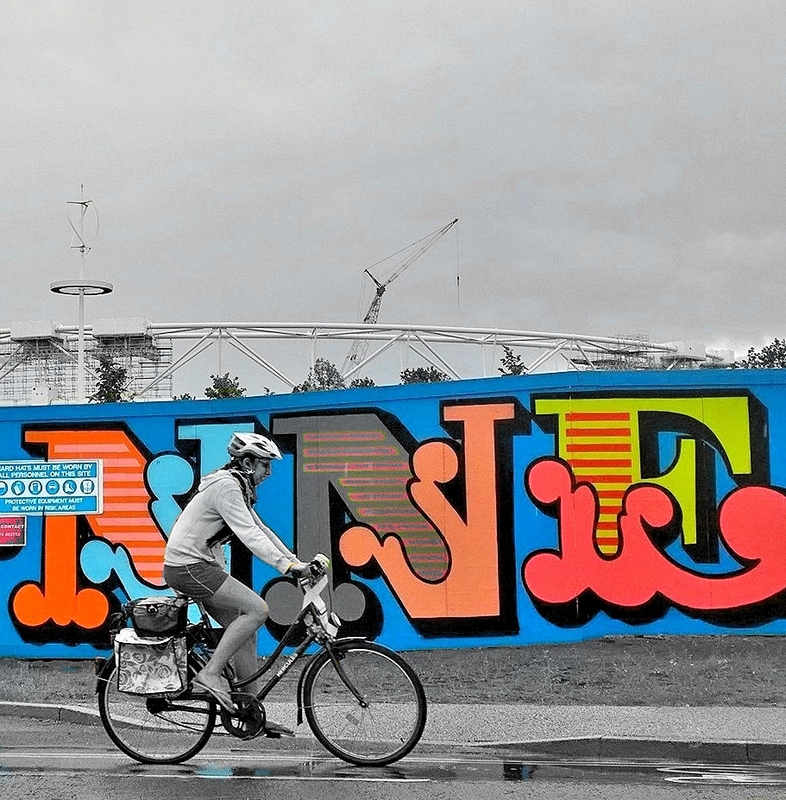 Part of the Living Walls project which seeks to create a series of World Class artworks in and around the Olympic Park. 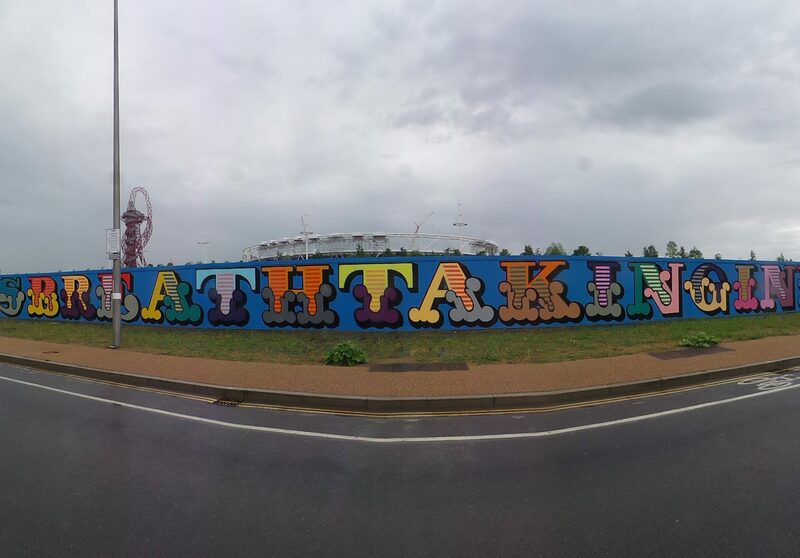 The mural is made up of an amalgamation of fourteen different words, each describing an aspect of the park or the games, hence the name of the mural ‘The Review‘. The words are ‘History, Abstract, Passionate, Traditional, Captivating, Pioneering, Survival, Spontaneous, Breathtaking, Individuality, Iconic, Connections, Storytelling and Idea’. All have been written in Eines own unique ‘Circus’ font and presumably representing his own views on the 2012 Olympic Games. 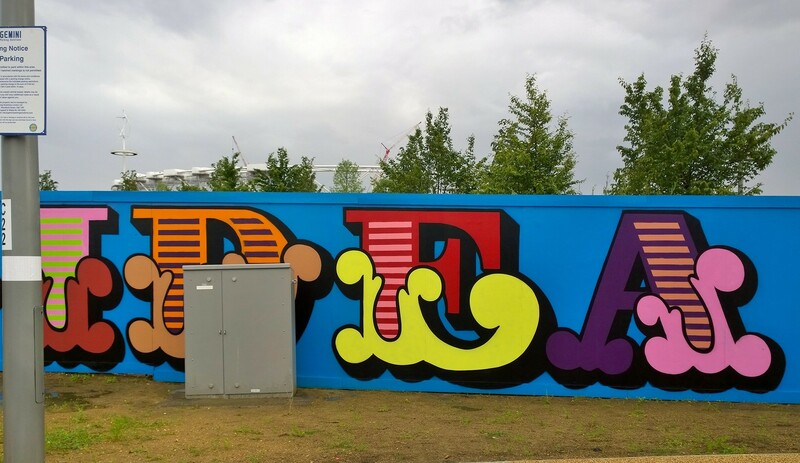 For Eine, a contemporary of Banksy, the mural represents the latest stage in his journey from notorious graffiti writer and sometime scourge of the authorities to big time crossover artist. 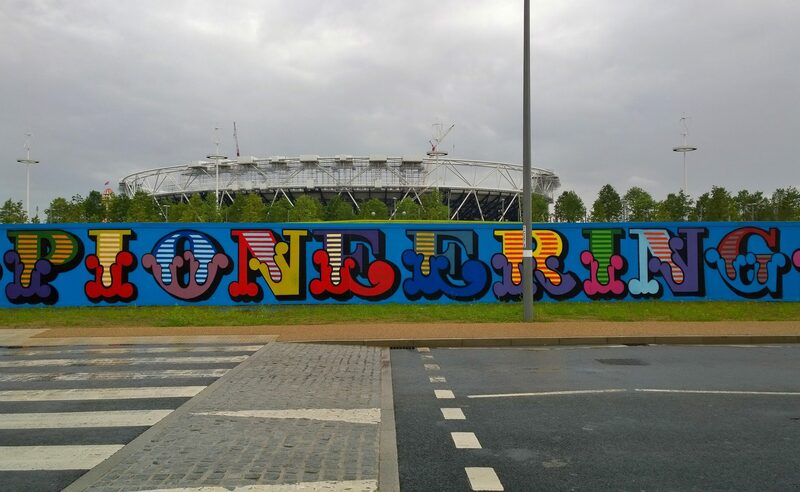 In 2010 a canvas of his was given as a gift to America President Barack Obama from David Cameron as part of an official visit to the White House and now he has taken centre stage in the heart of London’s Olympic Park. 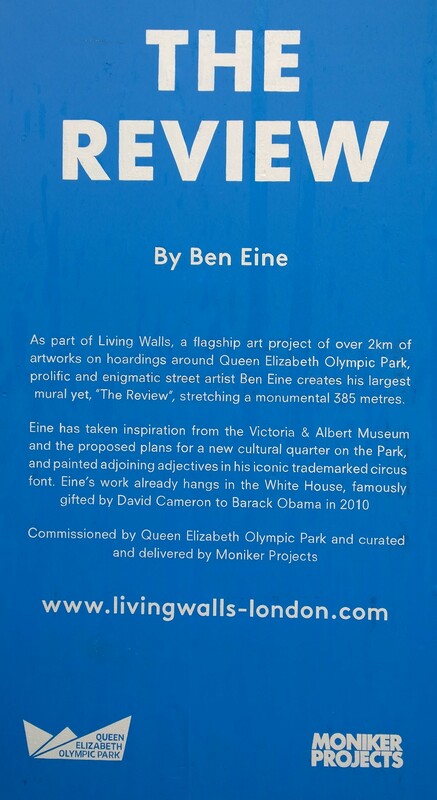 Ben’s work can be seen all over London most notably in Middlesex Street where he has painted the entire alphabet using the the local shop shutters as a canvas as well as another alphabet on the side of a wall close to the junction with Widegate Street. His ‘Scary’ on Rivington Street and his ‘Extortionists and Protagonists’ on Ebor Street both in Shoreditch can also still be seen and represent some particularly good examples of his work on the street. 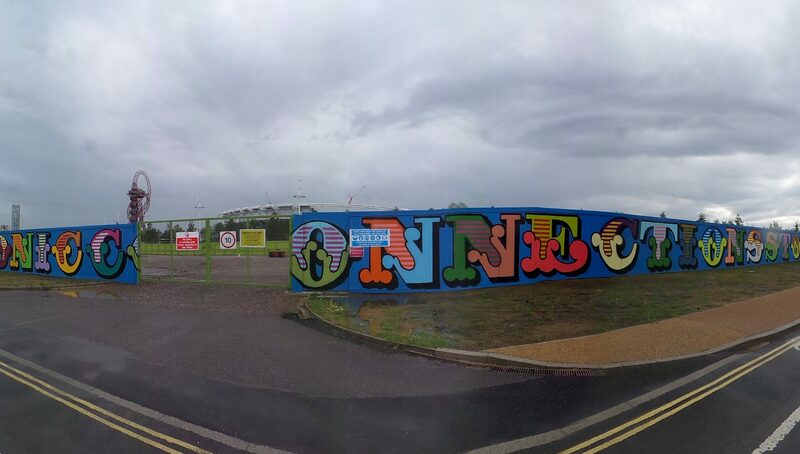 So for this post I thought I’d try and show as much of this epic mural as I can, it’s not possible to get the whole thing in one shot though so I thought I’d take everything, quite literally, word for word. 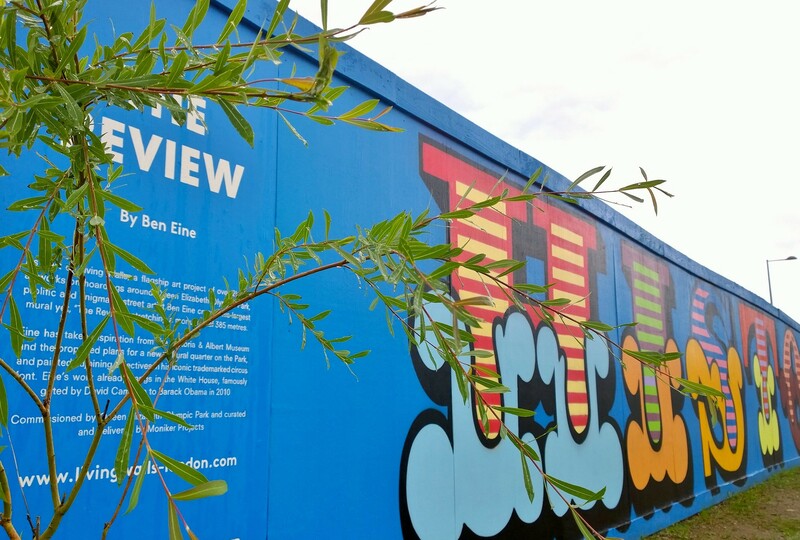 ‘The Review’ by Ben Eine is part of the Olympic Parks ‘Living Walls‘ project and was curated by Moniker Projects and Create London. 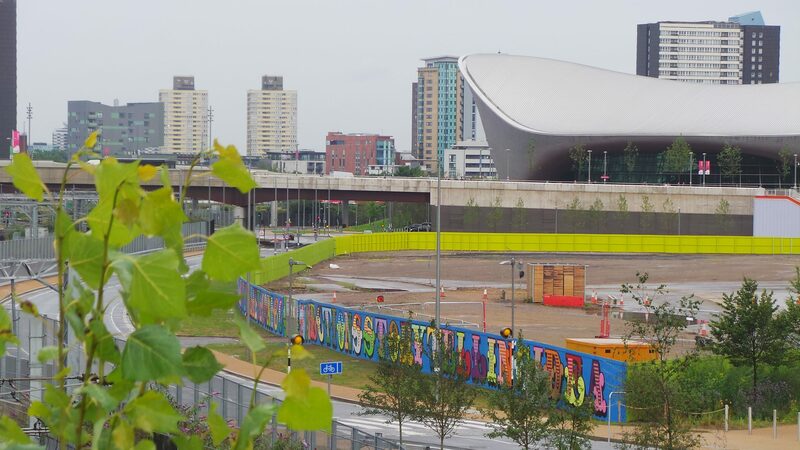 It can be found close to the Aquatic Centre on the Westfield side and can be accessed by foot from Stratford station.